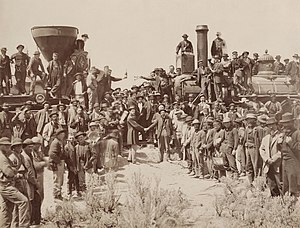 The transcontinental railroad provided fast, safe, and cheap travel. The fare for a one-week trip from Omaha to San Francisco on an emigrant sleeping car was about $65 for an adult. It replaced most of the far slower and more hazardous stagecoach lines and wagon trains. The number of emigrants taking the Oregon and California Trails declined dramatically. 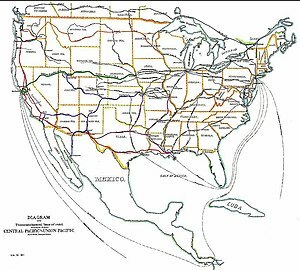 The sale of the railroad land grant lands and the transport provided for timber and crops led to the rapid settling of the "Great American Desert". 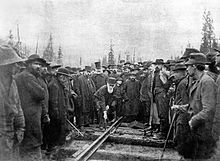 The first transcontinental railroad in Europe, that connected the North Sea or the English Channel with the Mediterranean Sea, was a series of lines that included the Paris–Marseille railway, in service 1856. Multiple railways north of Paris were in operation at that time, such as Paris–Lille railway and Paris–Le Havre railway. A second rail line connects Istanbul in Turkey with China via Iran, Turkmenistan, Uzbekistan and Kazakhstan. This route imposes a break of gauge at the Iranian border with Turkmenistan and at the Chinese border. En route there is a train ferry in eastern Turkey across Lake Van. The European and Asian parts of Istanbul was linked 2019 linked by the Marmaray undersea tunnel]], before that by train ferry. There is no through service of passenger trains on the entire line. A uniform gauge connection was proposed in 2006, commencing with new construction in Kazakhstan. A decision to make the internal railways of Afghanistan 1,435 mm (4 ft 8 1⁄2 in) gauge potentially opens up a new standard gauge route to China, since China abuts this country.